Looking for a fun Halloween activity to make with the kids this weekend? Well look no further, here is a healthy and delicious treat that is naturally gluten free and fun to make! 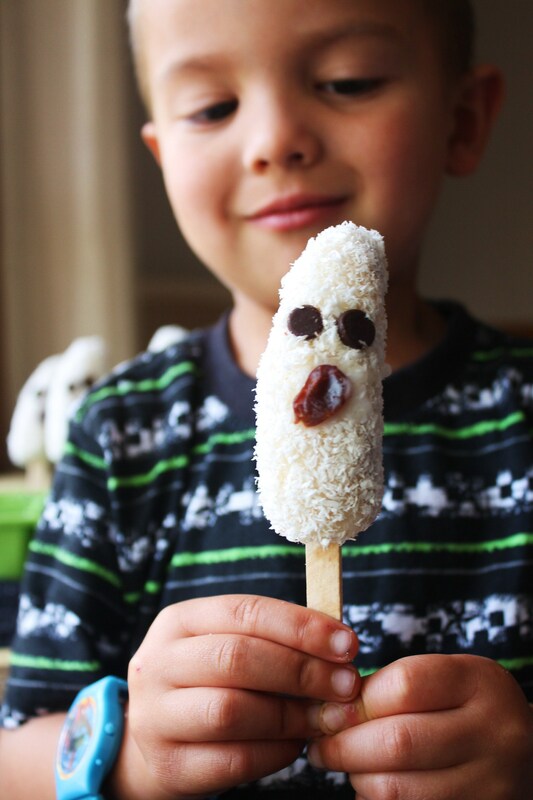 You probably have all of these ingredients on hand… and if you don’t have kids, no worries, grown ups like myself enjoy these frozen pops just as much. They are not just a halloween treat, leave the ghost decorations off and they become a yummy frozen dessert. My son could barely hold back from eating that pop before I could snap a photo! Peel bananas, cut in half. Insert popsicle sticks, place on small tray lined with parchment paper and freeze for at least 1 hour. Melt together coconut oil and honey in a small bowl. Whisk until smooth. 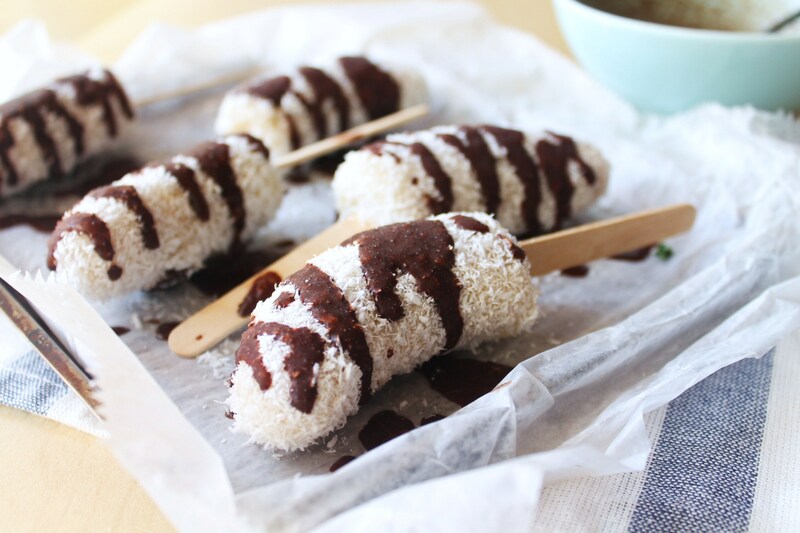 Using a spoon, pour glaze over frozen bananas, get a good coat on them and roll into coconut flakes, pressing lightly. Place back on parchment. Repeat with all of the banana pops. Make ghost faces using chocolate chips for eyes and raisins for the mouth. You might have to dip the chips in the glaze first then carefully press firmly into the bananas. Alternatively, you can melt chocolate, pour into a ziplock bag, cut small tip and pipe the face. Whatever is easiest for you. Place pops back in freezer for at least another hour to firm up. 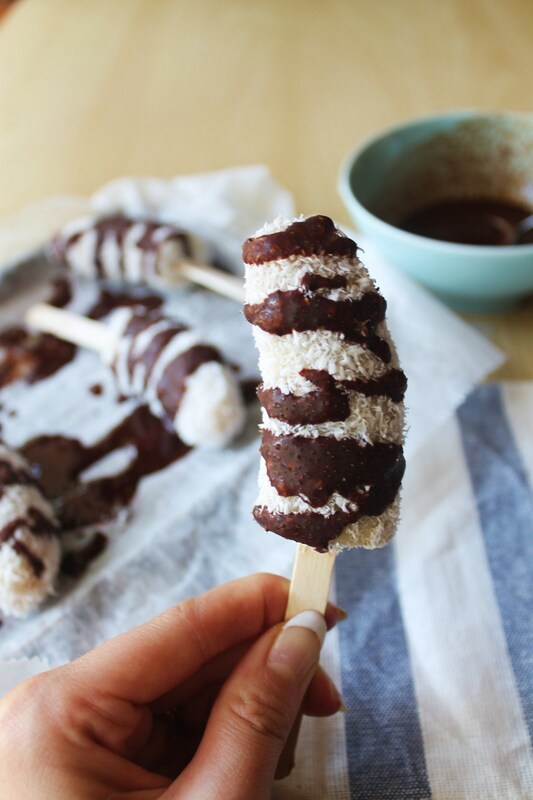 * I like to add about a tablespoon or 2 of cocoa powder to the leftover glaze, and drizzle over a few of the pops, or even completely coat for a chocolate coconut pop. Soooo good. Feel free to coat with nuts or more coconut. The possibilities are endless. 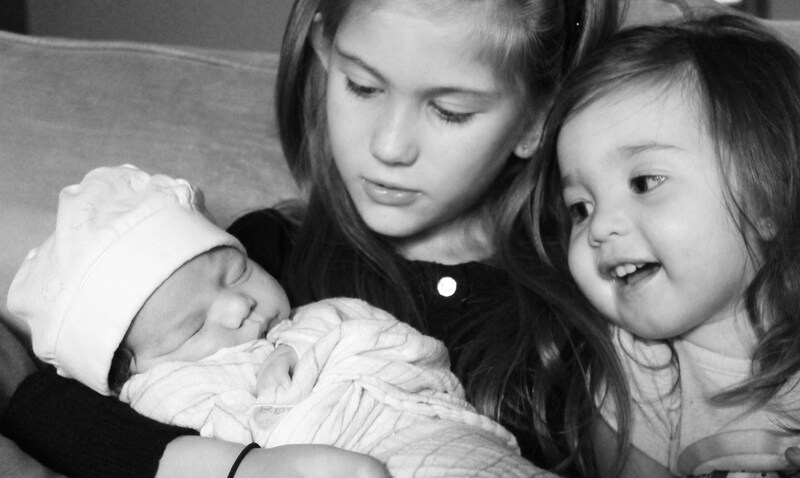 Here are my 3 girls…. 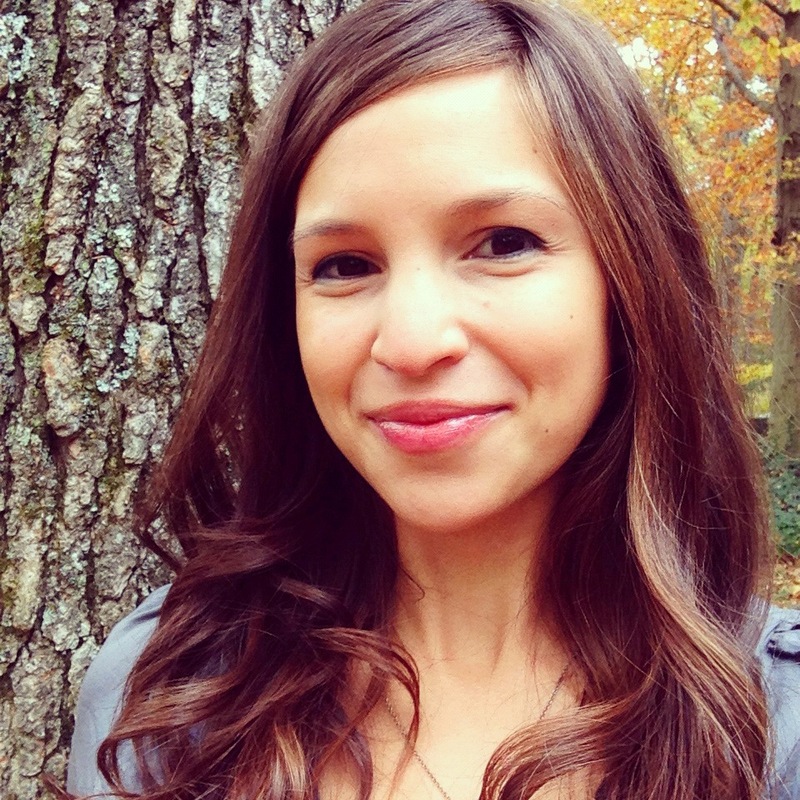 This entry was posted in Gluten Free, Life and tagged dairy free, gluten free, paleo, scd, vegan. Bookmark the permalink. Love this and you! 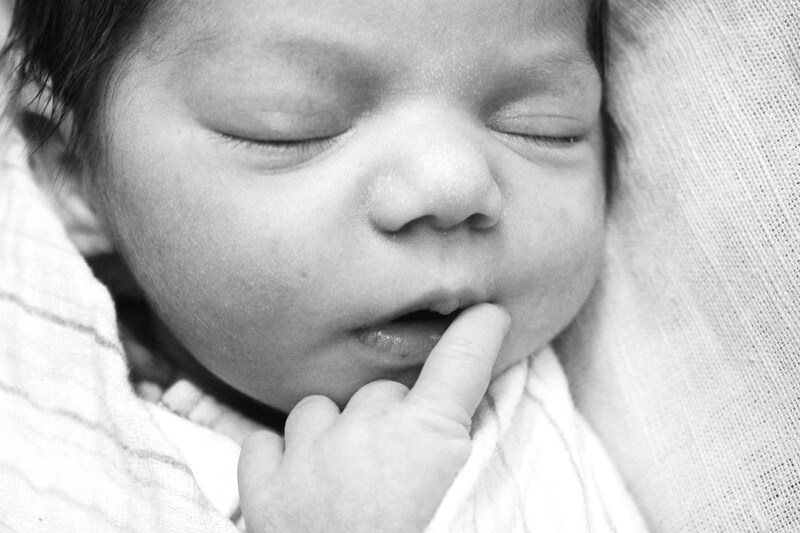 Congrats on the latest addition…she’s perfect. These will be fun to test out this summer! My neighbor just made some coconut milk / roasted strawberry pops that were fantastic! Maybe I’ll do a batch of each :) Thanks for the great ideas!